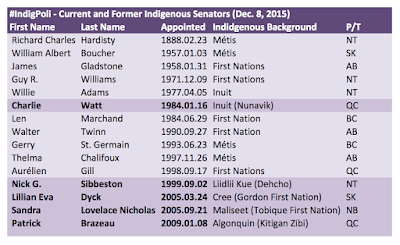 There are currently 22 vacancies in the Senate, now is the opportunity to considering First Nation, Inuit and Metis people who would make great Senators. With all this talk about Senate reform, scandals and abolition, now is a good time to remind people that there are hard-working Senators that do good work. 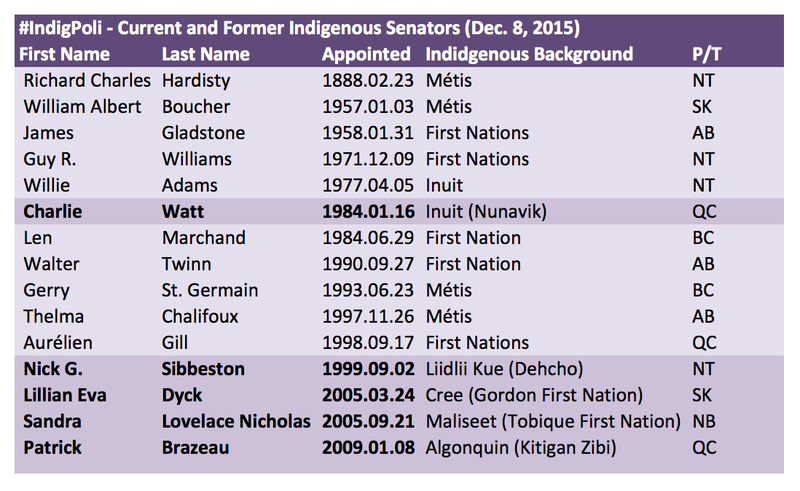 Including a handful of Indigenous senators. From an Indigenous perspective, First Nation, Metis and Inuit representation in the Upper House has been lacking. There are currently five Indigenous senators, with three becoming of mandatory retirement age over the next 5 years. Senators Watt, Sibbeston, Dyck and Lovelace Nicholas are members of the Liberal Senate Forum which is separate from the House of Commons Liberal Party of Canada caucus. Prime Minister Justin Trudeau removed the Liberal Senators from the Liberal Party caucus in January 2014. Senator Patrick Brazeau is currently styled as a Independent Senator but is not a sitting member, full restoration or potential to be removed are pending legal cases. There has been suggestions of abolishing the Senate. Respected professor and political pundit Emmet Mcfarlane suggests that abolition or certain structural changes to the Senate makeup would require constitutional change, with unanimous approval of Parliament and all 10 provincial legislatures. With Ontario, Quebec and other provinces against Senate abolition, it very unlikely that a constitutional change to the Senate would pass. Prime Minister Justin Trudeau and his government has chosen a different path (Read) to reform the Senate. Basically, the government would set up a expert panel who would review potential appointments based on merit and contributions to Canadian. The panel would intern suggest appointments to the Prime Minister for appointment to the Senate. The Prime Minister plans on appointing five new Senators early in the new year (2016) and fulfill all vacancies by the end of 2016. There are currently 22 vacancies and more to come, now is a good time to start thinking the many First Nation, Inuit and Metis people who could be appointed.